Prince William and Kate Middleton pose for a family photo after their graduation ceremony at St Andrews University in 2005. A media blackout was in place during this time thanks to a "gentleman's agreement"
London, England (CNN) -- A close college friend of Prince William, Julian Knight was there when Kate Middleton walked down the catwalk in "that" see-through dress and was one of a select few who knew about the couple's relationship before it was public knowledge. 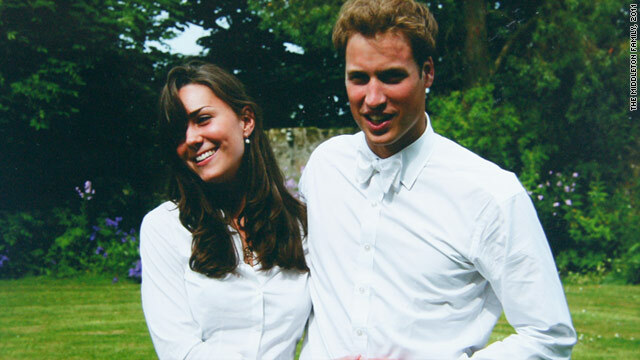 Knight lived down the street from Prince William in their second year studying at the University of St Andrews, in the small Scottish town, and saw first-hand Kate and William's early years as a couple. "They were always spending time together, going down to Anstruther to go banana boating or playing golf or going for a walk," says Knight. Because of a media blackout in place, Knight says life in St Andrews allowed them to get to know each other as friends first "without prying eyes." 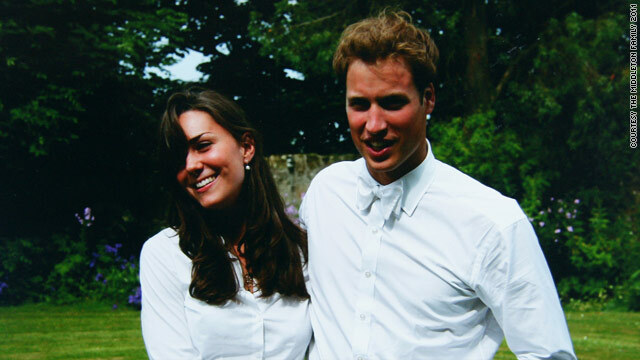 Although Knight and William grew apart after university, Knight reveals the student life William led and how it laid the foundations for a wedding the world will be watching on April 29. In the second year (of university), I moved to Hope Street. I lived in 11 Hope Street and he (Prince William) was in 14, but it was almost next door, and we were sort of in and out of each other's houses quite a lot. For me, he was just another guy. He's just another very down-to-earth normal guy. There were no real airs and graces if you like. It was just sort of, 'Alright mate, how are you doing?' and we had a relationship which was very matey (friendly) basically. I remember being in his room once and he (Prince William) had started to get into motorbikes, and he was looking at all these leathers. There were two on the screen and he was saying, 'I can't decide whether I want that one or I want that one.' I was just like, 'Well, why don't you get them both?' and he looked at me and was like, 'No man, these are like £1,000 ($1,600) each." I think at the time we were all on an allowance -- but I think it genuinely seemed like he didn't have any more money than the rest of us. He'd buy the odd tray of drinks in the pub, or shots or whatever, but so would everyone. He wasn't flashy or didn't wear a big watch ... he didn't rock up in amazing cars or motorbikes or anything like that ... even when I was at Highgrove (William's family home) -- I stayed at Highgrove once -- very normal. Nice double bedroom, quite big, but not massive; kind of like a hotel room. But it wasn't crazily mad or ostentatious in any way. 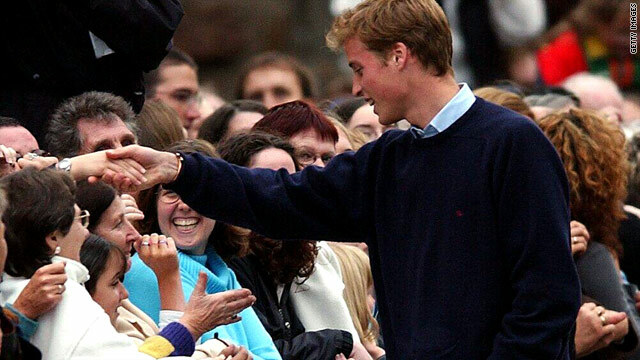 Generally he (Prince William) would walk down the street and no one would bat an eyelid. Generally he would walk down the street and no one would bat an eyelid. He'd be in the sweet shop or he'd be walking to a lecture ... or he'd be in Tesco (supermarket) buying a pint of milk, just like anybody else. I think it struck the shopkeepers in town, who were all local Scottish people, how normal he was, because he'd come in and buy the newspaper on Sunday morning or come in and buy some milk or a bottle of wine like anybody else. We knew ages before. In fact, it became quite amusing because we were obviously in the circle of people who knew they were together and we were just wondering when the press were going to catch on -- because it took a long time for the press to actually realize what was going on. I think it speaks volumes for the kind of protection he had, because there were a lot of people who knew they were together but no one said anything, so no one knew. I remember that specific night very well. She wasn't what you would call a risque girl. She was a pretty safe bet; quite conservative in the way she dressed and the way she acted. And here she was not wearing that much, looking amazing. I think everyone did think, 'Wow, she looks great. She looks amazing. She's beautiful.' And I think he (Prince William) probably looked to her and was pretty impressed as well. Graduation was great, it was a really good day. The Queen was there and the royal family was there and I remember walking out with him (Prince William) and it was the end because there were more photographers than I'd ever seen in my life. I think everyone realized the game was over because the protection that they had enjoyed was finished. The "gentleman's agreement" that the royal family had with the press was ending and it was open season as far as everyone was concerned from then on. You had people from magazines and newspapers coming up to students offering to clear their student debt for stories about Prince William.